Sedona real estate communities are as popular for their exceptional golf courses as they are for the red rocks. 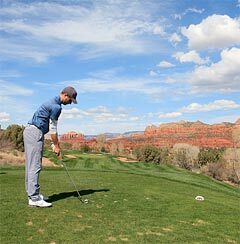 Found in Northern Arizona, Sedona can boast about its many challenging courses, which can be played year-round. Beautiful courses, beautiful weather and big challenges to sharpen your golf game await you. Below are links to some of the more popular courses if you’re looking for Sedona real estate and golf opportunities. Canyon Mesa Country Club is an affordable golfing challenge with an excellent course to hammer down your short game skills, making it the perfect test of your swing. The narrow fairways are tight and lined with trees. As for the Sedona real estate you’ll find here, there are 157 condo and townhouse units in this gated community. Oakcreek Country Club offers championship golf in the Sedona red rocks. This is a unique golfing experience described as the most beautiful spot in America. This player friendly course offers the challenges you want with classic tree-lined fairways. As for Sedona real estate, you’ll find a wide assortment of golf properties in various price ranges and locales (including three lakes and stunning fairways). Sedona Golf Resort provides a rare combination of challenging golf (a par-71 championship course), awe-inspiring splendor and for those seeking Sedona real estate, a large number of luxury properties. With its spectacular views of red rock formations, you’ll find this course a very rewarding experience. Plus, SGR was named one of the Top 5 Public Courses in Arizona by the Arizona Republic and Golf Digest. Verde Santa Fe Golf Course in Cornville is only a 15-20 minute drive from Sedona. This 480-acre master-planned, gated community caters to active 55+ adults. Centered by the Black Hills with views of Mingus Mountain, this high desert course offers natural arroyos and four lakes that border the 10th and 18th holes. I'm Realtor® Barbara Baker. Let me show you Sedona real estate in any of these or other popular golf communities today. Simply call me at 928-301-0669 or e-mail me today and let me know what you’re seeking in Sedona real estate and I’ll find the home in a golf community for you.